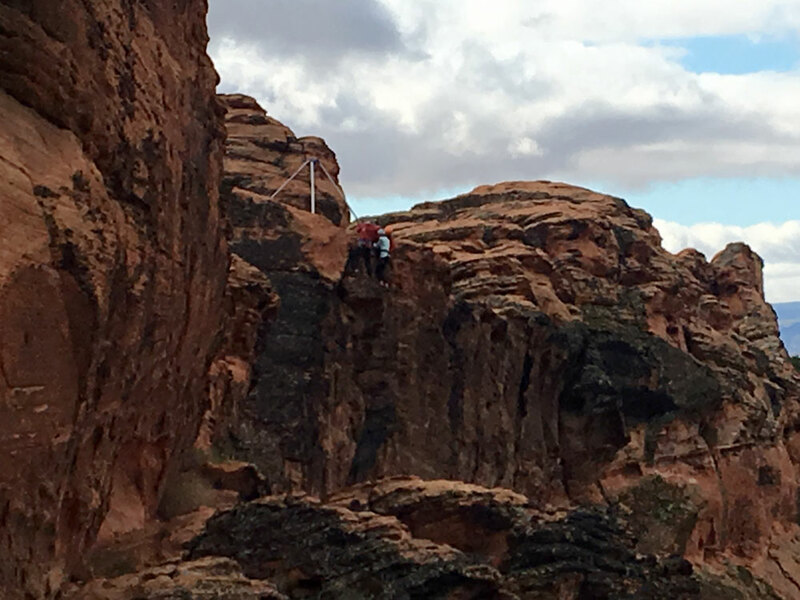 ST. GEORGE — It’s been exactly four years since Brittany Anne Fisher fell from Cougar Cliffs while rappelling during a spring break trip in 2012. 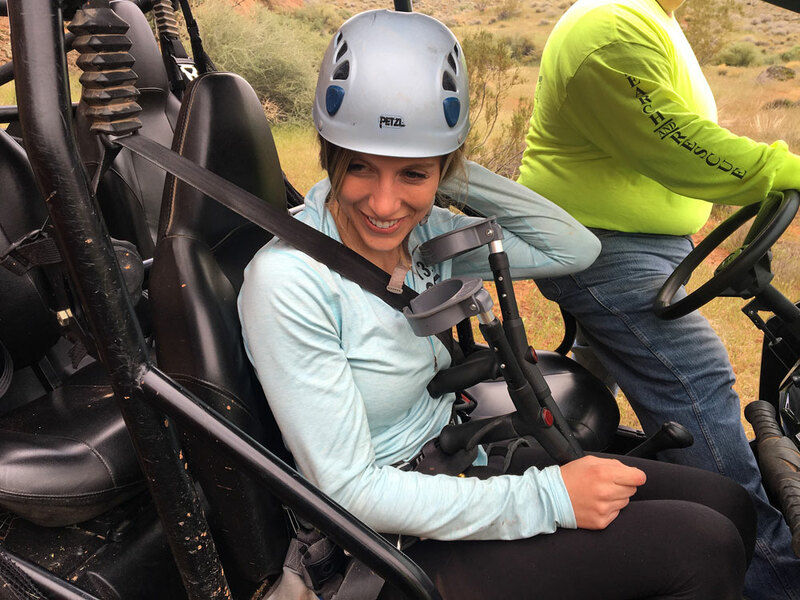 Saturday, Fisher, now 24 years old and paraplegic, returned to face the rocks that changed her life. Cougar Cliffs is a popular rock-climbing area off state Route 18 in Washington County. 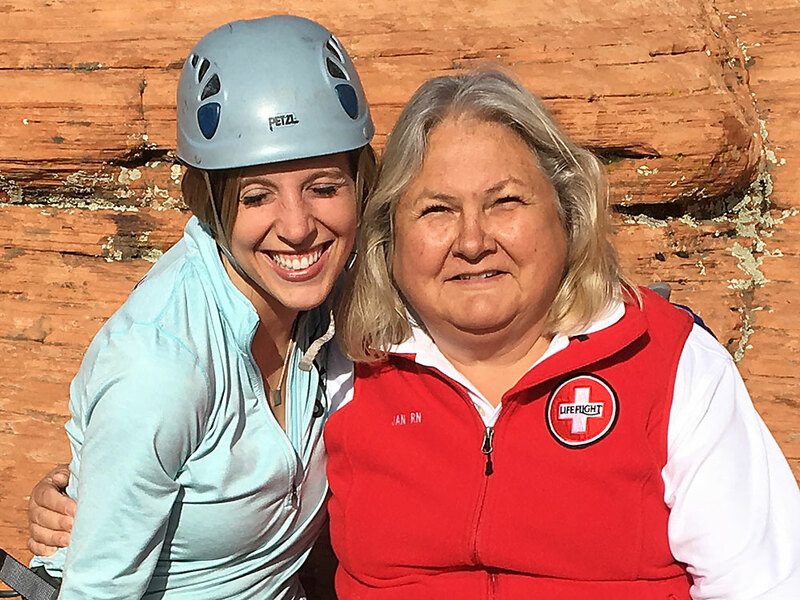 On March 12, 2012, Fisher fell some 60-80 feet off the cliffs in a near fatal accident that damaged her spinal cord. Saturday morning brought triumph for Fisher as she rappelled down the face of the red rocks in a safety harness shadowed by Washington County Sheriff’s search and rescue high angle rope rescue team captain Rob Girouard. As one who loved to run and compete in track, the loss of her legs and mobility became a heavy burden for her to lay down, Fisher said. She also lacks normal feeling in her hands as a result of rope burns she sustained in the fall. It is also March now, which means my 4 year anniversary of my accident is coming up next week. So this chapter hold special meaning around this time of the year. Across the margins of my scriptures in this chapter I have written: Justice & Mercy. Fisher not only endured arduous physical therapy sessions but also overcame painful battles of mental depression. When asked Saturday what has sustained her, without pause she said: “My faith.” She’s healed in every way except for her legs, she said. 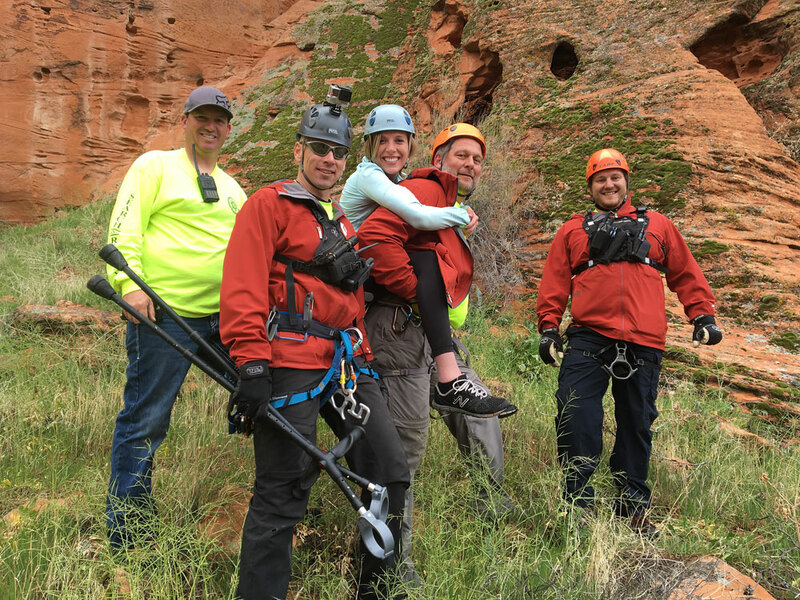 After rappelling Cougar Cliffs with Girouard at her side, Fisher said she felt scared and nervous at the top edge but OK after that. 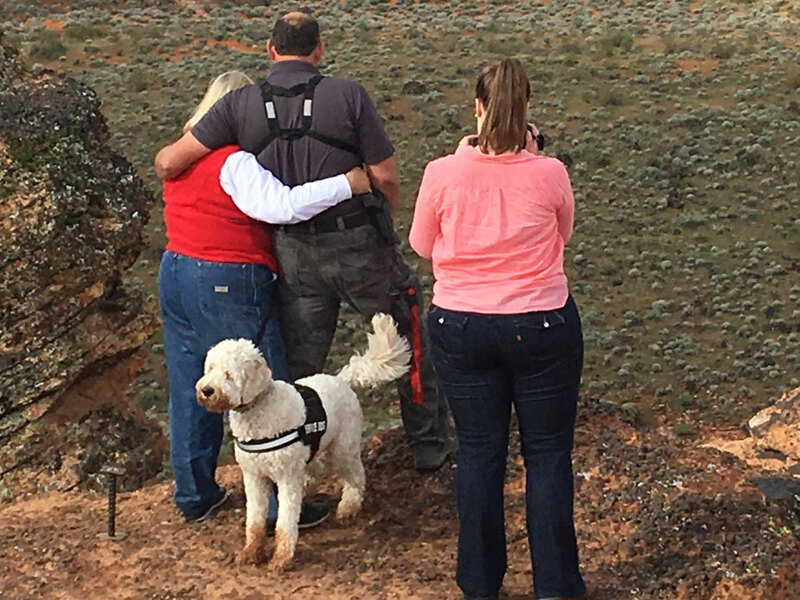 Her return to Cougar Cliffs was not just a triumph but a reunion of sorts. 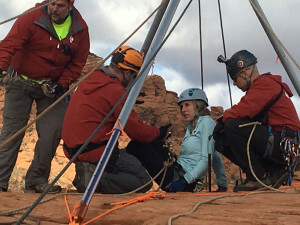 Many of those who had been with Fisher or come to her aid on March 12, 2012, came back to support her as she faced down the rock. Registered nurse Jan Call, now retired from Intermountain Healthcare’s Dixie Regional Medical Center after 40 years of service, came. 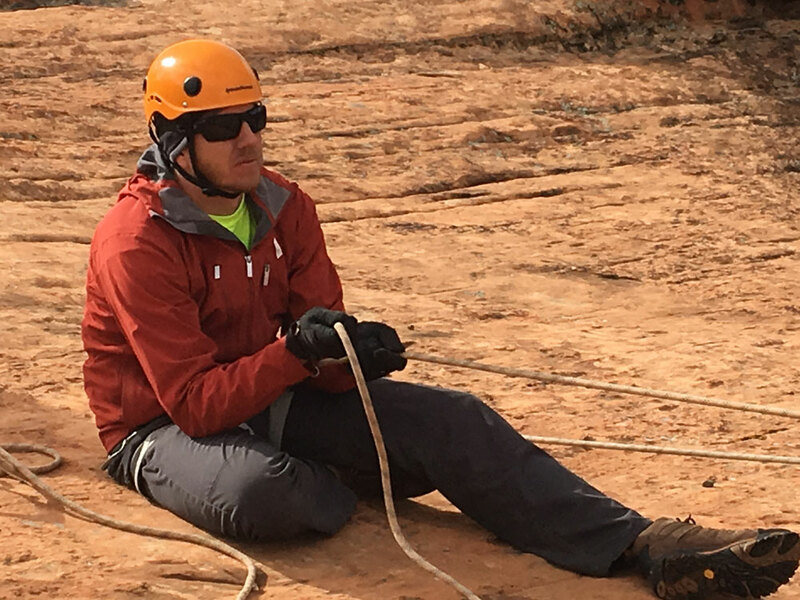 Washington County Sheriff’s high angle rope team volunteer and search and rescue commander, Mike Thomas, who carried her out on his back in 2012 not only came but organized Saturday’s event. Intermountain Healthcare’s Life Flight helicopter and crew flew in. 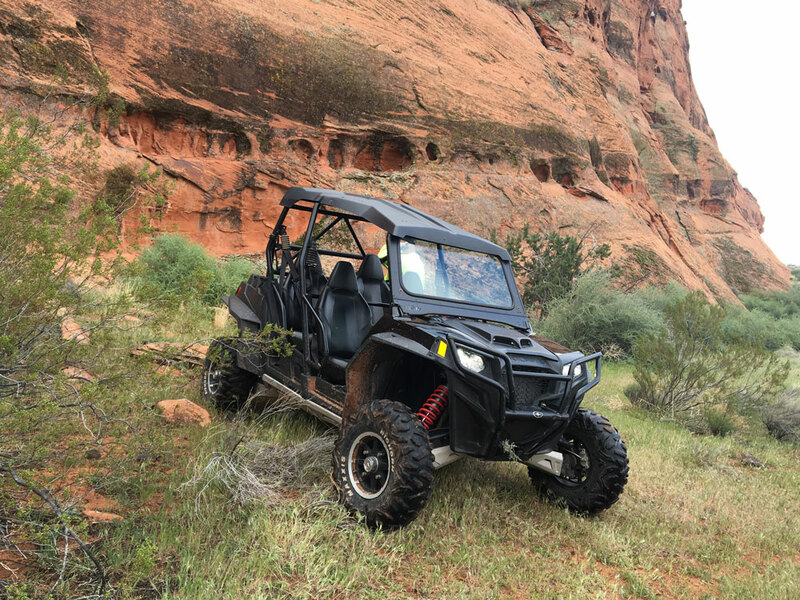 Washington County Sheriff’s Deputy Darrell Cashin and search and rescue team volunteers Jonathan and Jerod Hummel, Merril Campbell, Lloyd Leavitt and Joe McCarther all came. Then there were friends and family. Among them: Fisher’s boyfriend, Trevor Frank, parents, Bryan and Kaaren Fisher, sister Laura Clayton with husband Christian Clayton, and longtime high school friend Alyssa Stevens. Not the least of those in attendance was Brittany Fisher’s now vital companion Cooper, or “Coop,” a standard golden doodle yet in training. Brittany Fisher expressed her thanks to everyone on-hand who helped her accomplish what she came to do Saturday. And conquer seems to be something that Brittany Fisher does. She has a future planned, having applied for work as an elementary education teacher, she said. 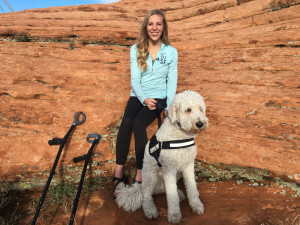 She has replaced running with sit skiing, mountain boarding and cross-country skiing. And here’s the kicker: She is in training for the 2018 Winter Paralympics.